Japanese awakened to Donald Trump’s victory in disbelief, coining the label “Trump shock” to go with other “shocks” memorable in their history with the United States.1 A failure had occurred: of the US media, of the US role as the beacon of democracy, and of both a model of capitalism2 that was supposed to forestall angry backlashes and the international system,3 on which Japan had relied. US isolationism loomed, leaving China the clear winner, along, perhaps, with Russia or North Korea. 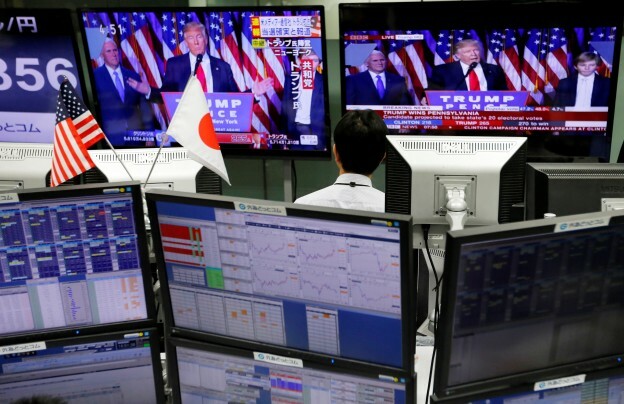 For a few days, at least, there was an element of panic across the political spectrum, as Abe was seen as lacking personal ties to Trump—a matter highly valued—and Trump was viewed as having predispositions not favorable to Japan’s interests. The Japanese response to Donald Trump’s election ranged from a severe spike in anxiety, to confirmation of recent suspicions about the United States, to occasional expressions of a possible increase in opportunity, which appeared after Abe started to offer reassurances based on his phone call and, especially, his November 17 early meeting with Trump. Along with concern about the impact on Japan and its ties to the United States came worries about the effect on China, Sino-US relations, and the balance of power in East Asia. The convulsions of November 2016 were, in places, equated with 1945 and 1989-1991 as paradigm changers, even if the meaning is vague. Yet, a level of calmness soon set in, with care not to make the situation even worse mixed with some anticipation that it may later turn in a more positive direction. Japan has seen its world turned upside-down in November with scarcely any sign of media anticipation of these developments. Setbacks came one after the other: the collapse of the Park regime, endangering the vital ROK agreement; the about-face in Philippine policy toward China under Duterte—trouble for the cornerstone of Abe’s Southeast Asian diplomacy; Trump’s calling into question the Japan-US alliance; and the arrest of Minister Ulyukayev on November 15, setting back economic talks with Russia and hopes for a breakthrough at the Yamaguchi summit. These unexpected setbacks leave many dazed, alarmed about the impact on diplomacy to contain the aggressiveness of China. Optimism about Abe’s foreign policy is shattered.5 Sankei leads in warning that China is preparing to seize this chance to expand its regional influence as US influence diminishes, much as it grasped the 2008 Lehman shock to discard Deng’s caution on foreign policy.6 China’s overall goal is hegemony, readers are warned, even if new economic worries make it cautious now about damaging US relations, although it would retaliate against Trump, if need be, e.g., by holding the US economy hostage. Reverberations from Sino-US tensions could hit Japan too. Yet, little blame has been put on Abe. Domestic factors abroad are perceived as at fault. As the focus turned to the likelihood of increased Sino-US tensions, e.g. after Trump spoke with Tsai Ing-wen by phone, there was a growing sense of relief in Japan. Optimism about Japanese foreign policy was pronounced through the summer of 2016. The Japan-US alliance looked stronger than ever with frequent US praise for Abe’s moves in 2015 and high hopes for TPP. The July decision of the International Court of Arbitration was seen as solidifying resolve against China around the South China Sea. Trilateralism with South Korea as well as the United States was finally gaining momentum. Then, when Abe met Putin in September, media optimism knew few bounds, as a breakthrough appeared to be on the horizon in December. Even as other troubles arose, the one that stole the spotlight was Trump’s surprise election. Abe had apparently asked in June if a “pipe” to Trump was not needed, but Japan’s foreign ministry was confident that Hillary would win. So, he met only with her in September when he visited New York, which one source called a big mistake.7 Thus, amid the alarm across Japan right after Trump won, Abe rushed to place a quick call from a foreign leader to Trump and to arrange the first meeting. Saving TPP was no doubt desired, but more important was reaffirming the alliance with no prospect that US troops would be withdrawn and reassurance to Trump that Abe of late has been actively boosting Japan’s contribution to the collective defense effort and could try to do more. Personal pursuit of Trump became the primary foreign policy goal. The shock of the Trump victory centered, above all, on the impression that Japan, as a US ally, would no longer have a special relationship, i.e., Trump did not really value the alliance.8 Nor would it have an anchor on which it could rely in facing China or, despite its pretenses to the contrary, Russia. By, seemingly, going off the rails, the United States left in doubt the international system, the regional order, and even an understanding since the 1940s of what is capitalism or the values associated with it. On the political left the target was US protectionism, confirming past fears that US support for internationalism is undependable. On the right, the primary concern was isolationism, reinforcing previous accusations of abandonment and lack of will to back Japan against security threats. Anxieties across the spectrum were aroused. On November 16, Sankei reviewed the newspaper editorials in response to Trump’s victory.9 It found warnings such as this is an earthquake shaking the foundations of the postwar international order, and regrets being expressed about the “American dream” now being something of the past. Doubts were raised about US international leadership. Various suggestions were offered for what Japan should do, including in response to new moves by China to fill the vacuum during the transition. One of the main points made was to avoid Japan-US friction, which China would seek to exploit. Alarm was accompanied by calls for urgently forging relations of trust with the new president.10 The greatest uneasiness was about security—US non-intervention in international disputes, especially in deterring Chinese adventurism. The second concern was economics—allowing China to take the lead in multilateralism, as TPP is lost. Third, was fear of a collapse of internationalism, beginning with the Paris Climate Accords. Finally, beneath all other concerns was doubt about Japan’s future, adrift from the only anchor it had known since the end of WWII and without a promising strategy. Some stressed the economic impact (on Japan’s exports, the value of its currency, or the regional economic order). Others pointed to the security fallout (on countering threats from China and North Korea, above all). Most were at a loss to suggest what Japan could do except to intensify efforts to win Trump’s trust and convince him to cooperate. The reality of dependence on a single ally was clear. Soon articles started appearing with the dual message that Trump is a realist after all and that Abe is making progress in forging a good personal relationship with him. It was revealed on November 15 that Gen. Michael Flynn, Trump’s main security advisor, had secretly met with Suga Yoshihide on October 11, offering assurance that Trump would not make big changes in US security policy.12 In taking Abe’s call quickly, Trump on November 10 gave additional assurance that he recognized this “great partnership,” and in meeting with Abe on November 17 before other foreign leaders, Trump eased many concerns. His definitive rejection of TPP was a blow, but more important was his affirmation of the special relationship, and calm discussion by Abe of readiness for suitable burden sharing for the US forces stationed in Japan. Former ambassador to the United States Fujisaki Ichiro on November 12 argued that US campaign rhetoric should not be taken as gospel, e.g., Carter failed to follow through on talk of withdrawing US forces from Korea.13 It is not easy to alter the foundation of US diplomacy and security, especially with Congress and the armed forces playing a role. US-Russia relations as nuclear powers, and Sino-US relations in the South China Sea and cyber attacks are established, while talk of more economic pressure on China will face limits. Japan has time to convey its own thinking and get reconfirmation of the importance of bilateral relations, Fujisaki added, offering reassurance that policies supporting US influence in East Asia would not change. On November 9, Fukisaki had met with Abe to council him that he should tell Trump Japan too is for a new alliance relationship, urging Trump to recognize the great importance of this dyad. Japan’s Ministry of Foreign Relations had also made clear that US campaigns have little impact on foreign policy, as seen when Reagan pulled back from his readiness to recognize Taiwan. Yet, the best that could be said is that Trump has little interest in Japan and will decide to rely heavily on his advisors. On the same day, Park Cheol-hee was similarly reassuring.15 He argued that Trump has to date been an outsider, suspicious of the US role as “world policeman,” but he is now becoming an insider, whose advisors and congressional partners will steer him in a different direction. He will learn that isolationism is incompatible with the goal of “making America great again.” As a Korean, Park expects that Trump will recommit his country to the Japanese and South Korean alliances, while learning that allowing more instability now will only increase the security burden later. As one newspaper after another offered at least one calming, authoritative response, the most enthusiastic embrace of Trump came from Sankei’s long-time US reporter, Komori Yoshihisa. Dismissing the troublesome campaign statements about Asia that others had on their minds, Komori depicted Trump as a military hawk who would pursue the agenda of congressional Republicans, who have long condemned Obama as soft on China.16 If Obama talked “rebalance” while cutting the US air force and navy and timidly countering China in the South China Sea and East China Sea as well as responding weakly to North Korea, Trump will soon face China from a position of strength. Given the more limited outrage shown toward Trump’s non-Asian related remarks in Japan, compared to most of Europe, such assurances could win support. The political right, which had often been critical of Obama for doing the very things that Trump now appeared to be planning—weak support of Japan, hesitation for US leadership as the world’s policeman, softness toward China’s expansionism, inward-looking priorities—was cautious about accepting Komori’s prognosis for Trump. The strength of these anxieties before Trump’s victory made them fertile soil for deepening alarm, even if some were seeking an opening for a more independent foreign policy. Yet, simultaneous setbacks in Russia, South Korea, and Southeast Asia left the right wing at a loss for how to compensate for what Trump might do. On the left, as on the right, talk began that Trump would open space for Japan to carve out a more autonomous foreign policy. Yoshimi Shunya in Tokyo Shimbun wrote that the collapse of the United States will make Japan’s alliance more relative, while describing the pleasure in Russia and China about the election results.17 What is disconcerting, he asserted, is that Trump does not grasp the historical complexity of the postwar world order with shared values and will quickly allow US influence to weaken in East Asia. Yet, he discerns some positive connotations, enabling Japan to reposition itself within the US-Russia-China triangle. This response was hopeful of Japan’s new opportunity, although it was also pessimistic on working with Trump. Japanese are concerned about the economic impact of Trump beyond the collapse of TPP plans.20 In response to Japan’s 38 percent tariff on US beef, Trump has threatened to impose a 38 percent tariff on Japanese cars. With NAFTA under attack, car production in Mexico may also be hit with tariffs. After earlier periods when US criticisms focused on Japan’s lack of free trade, the focus has turned to Japanese criticisms of US moves away from free trade, coming at a time when Abenomics is seen to be in trouble. On November 23, Mainichi Shimbun regretted Trump’s decision to reject TPP. The idea of “America first” and protectionism will not be in US or Japanese interests. By focusing on bilateral talks and protecting jobs for one’s own workers, the results will be limited. The article recalls the US pressure on Japan in the 1980s-90s, which did not really help US automakers. As co-leader of TPP with Washington, Tokyo should try to get Trump to reconsider, the article argued. For Yomiuri Shimbun the same day there was no sugarcoating this mistaken decision, but Trump’s choice of several conservative hardliners for security positions was viewed with greater equanimity. The overall response was more muted about Japan’s prospects. Few were optimistic that it could navigate a change from one era to another with less US support. Yet, the issue was difficult to treat in the abstract without focusing on the impact on China. Trump’s priority for economic pressure on China is at odds with Japan’s priority on military pressure. Indeed, Japan’s economic approach centers on TPP, leaving many concerned that RCEP led by China with Japan included will prevail instead, given the protectionist orientation of Trump’s approach. The right is rather inclined to start by reaffirming the alliance and then to seize the opportunity to positively develop Japan’s role in sustaining the international order and policies apart from US ties.26 One journal devoted a lot of attention to whether Trump is good for China or not.27 To be sure, he had engaged in some hard-line talk, such as imposing a huge tariff, but a lot of voices in China seem to be welcoming his election after what appeared as some unease. They saw the blow to Japan that would follow, the instability from an “American first” approach, the end of values diplomacy and the pivot, and the focus on the internal US economy likely to drive Trump to cut a deal with China. Should a trade war begin, WTO rules would help China. If early tensions arose, as with prior US presidents except Obama, ties would later stabilize. While Chinese hoped that Trump would talk to North Korea and help to preserve the regime, should he take a more forceful stand, Pyongyang would be likely to turn to Beijing and listen to it. In this set of articles on November 21, China was expected to be the big winner. Nikkei on November 21 called on Trump to support the Paris climate change agreement, implying close cooperation with China as well as Japan on this plan, which Trump had promised to abandon in his campaign. Japan’s business circles appeared to be more riled by Trump’s shifts in US policy than the security types. Gendai Business on November 21 reviewed the Abe-Trump get-acquainted meeting in New York with an eye to managing China.28 Not leaking the contents of the talks is treated as important in building trust between these leaders. Abe explained that Trump could be trusted. Presenting a driver to Trump, Abe was engaging in “golf diplomacy,” readers were told, with the explanation that persons familiar with the US scene understand that golf is where business ties are nourished for those who play. Mention is added of Kishi, Abe’s grandfather, playing golf with Eisenhower. At this meeting they are viewed as discussing free trade and a liberal circle excluding China. The article suggests that Abe gains capital from this meeting that he can use in meeting Putin in December. Koizumi in 2002 met Kim Jong-il and could convey impressions of him to other world leaders, as Abe now can do as first in meeting Trump. The Trump election is viewed as accelerating the Obama transition from the US role as world policeman, described as a big change in the world power balance along with 1945 and 1989-1991, which will be tested by China’s ambitions to expand at sea. Before long, the focus will shift from ISIS to China’s maritime moves, while North Korea remains unpredictable and Park Geun-hye is a lame duck. Abe seeks to avoid facing a dual front line against China and Russia. The article explains that Abe has good chemistry with Putin, even suggesting a new quadrangle of Japan, the United States, Russia, and India, as if they share a set of values. It notes that China is pressing for a different grouping of 1945 war victors aligned against Japan, but it will fail. Yet, the article worries about Abe-Trump chemistry, since “America first” does not correspond to Japan’s expectations. It sees Japan now assuming a role of leadership among democracies, finding an opportunity in Trump’s coming retreat. In Best Times on November 19, analysis focused on what would happen between Trump and Xi Jinping, arguing that Trump’s approach is still unclear even if the Chinese Communist Party is welcoming his election. Constructing what Xi’s call to Trump was like, the article suggests an effort to forge a kind of G2 with “win-win” cooperation to resolve regional and global issues in keeping with earlier Chinese signs of wanting to improve US relations. Trump is desired because: he strongly opposes TPP; he casts doubt on the Japan-US alliance and NATO with a strong possibility that the “rebalance” to Asia will be in retreat; he takes a transactional business approach to relations without concern about values (there may be a trade war but not for long given the US losses); there is reason to believe Trump would be interested in joining the AIIB and silk road projects; and Trump’s election signifies the defeat of American democracy. US-style globalism is in retreat, giving China reason to be happy, the article concludes, sustaining the alarm expressed in Japan. Japanese sources portray China as far more concerned about Hillary’s security policies than Trump’s economic policies.29 It saw her as having played a large role in the “pivot,” in relations with Myanmar and Vietnam at the expense of China, and in pushback on the South China Sea. Thus, she would be Obama on steroids, prioritizing a close alliance with Japan. Whereas Trump would not be a close partner of Japan, would stop TPP, would set aside “universal values,” and would depend on Republicans, who usually are easier partners for China. No wonder, Japanese took Chinese writings as a sign that China is the winner. Such reasoning was reinforced in Gendai Business on November 22, which saw Trump as an elderly novice, who cares primarily about money and will fall prey to Xi and to US interests keen on making money in China. References to Pence-Xi and Trump family-Xi connections were raised to affirm this case. On November 18, Yukan Fuji explored Trump’s posture to China and Japan. A rise in military expenditures with Japan asked to do more is the focus. Globalism will be replaced by “America first.” Isolationism will replace being the “world’s policeman.” Yet, there will be a big boost to missile defense and the military. The article reports that the Trump camp sees Japan and South Korea losing trust in Obama, who failed to deliver on the “rebalance,” whereas the massive military buildup ahead will be aimed at China and offer reassurance, preventing China from acting at will. But, as a businessman ready to deal, Trump poses a danger. Given the threat his team sees facing Japan from China and North Korea, they are asking why Japan is spending so little on defense. The article asks how Abe should respond given the dual issues of facing China and boosting military expenses, e.g., to 2 percent rather than 1 percent of the GDP, as is expected of NATO. The expectation is of a closer US alliance tougher on China, requiring Japan not just to spend much more money but also to bear more risk. A Sankei article on November 17 on the Trump shock asks how he will face China, which is seeking to become the global center. Many foresee a reduced US role in Asia and a growing economic clash with China, as China seizes the opportunity to expand its influence in Asia. Economic protectionism and other factors will weaken alliance ties, some add. As countries lose confidence in Washington, as is already occurring, they will draw closer to China. However, the decline of US military spending will be reversed, and China’s ambitions will be more actively contained, some conclude. In addition, China has a lot of reason to be concerned about Trump’s economic impact. Thus, after mid-November with emphasis on military cooperation in addressing the assertiveness of China, the Japanese coverage of Trump was becoming less critical. The conservative camp was growing more hopeful about Trump, viewing him in a trilateral context with China. Many in the business community and on the political left were dubious. Even among realists who value internationalism, the doubts about Trump remained strong. For example, Hosoya Yuichi wrote that the postwar consensus of neo-liberalism was market economics and welfare states, but this has been shattered by post-Cold War globalization’s priority for individualism and personal responsibility, undercutting the socially weak. Trump will boost the US military but not for the defense of the international order and other nations. US wavering between the two poles of internationalism and isolationism has tilted toward the latter, but Hosoya finds it fortunate timing that in 2015 Japan passed the collective defense law and can now come to the defense of the United States and have more credibility in its support for the rule of law, even if it cannot replace Great Britain and the United States as leaders in international society.34 Trump may become a convenience for the right wing to pursue its agenda, but both realists and business are nervous about his potential impact on the region. 1. Sankei Shimbun, November 12, 2016. 3. 2. Sankei Shimbun, November 13, 2016, 7. 3. Yomiuri Shimbun, November 12, 2016, 3. 4. Yomiuri Shimbun, November 13, 4. 5. Toyo keizai online, November 25. 6. Sankei Shimbun, November 16, 9. 7. Agora online, November 22. 8. Yomiuri Shimbun, November 10, 3. 9. Sankei Shimbun, November 16, 2016, 6. 10. Mainichi Shimbun, November 10, 2016, 5. 12. Yomiuri Shimbun, November 15, 2016, 4. 13. Mainichi Shimbun, November 12, 2016, 1. 14. Mainichi Shimbun, November 13, 1. 15. Tokyo Shimbun, November 13, 2016, 4. 16. Sankei Shimbun, November 12, 2016, 9. 17. Tokyo Shimbun, November 14, 2016, 4. 18. Sankei Shimbun, November 15, 2016, 2. 19. Yomiuri Shimbun, November 15, 2016, 2. 20. Yomiuri Shimbun, November 16, 2016, 4. 21. Mainichi Shimbun, November 11, 2016, 9. 22. See articles in the Sunday Mainichi, November 27, 2016. 23. Yomiuri Shimbun, November 15, 2016, 9. 24. Sankei Shimbun, November 15, 2016, 8. 25. Yomiuri Shimbun, November 12, 2016, 7. 26. Sankei Shimbun, November 16, 2016, 2. 27. Newsweek, Japan edition, November 21, 2016. 28. Gendai Business, November 22, 2016. 29. Gendai Business, November 21, 2016. 30. Sankei Shimbun, November 17, 2016, 7. 31. Yomiuri Shimbun, November 17, 2016, 2. 32. Tokyo Shimbun, November 16, 9. 33. Sankei Shimbun, December 6, 2016. 34. Yomiuri Shimbun, November 16, 2016.